Valentine themed Memory Box craft die featuring a heart embedded in an intricate circle. Great shaped brads for fastening paper, embellishments, tags and more to scrapbook layouts, greeting cards and other paper craft projects. Package contains 50 metal brads. Approximately 3/8in. Shapeabilities Heart Latte Etched Dies Cuppa Coffee, Cuppa Tea Collection by Sharyn Sowell is a set of five dies that includes a cup and saucer with a heart latte design inside the cup, along with a spoon. The design is a view of the top of your drink. Cuppa Coffee, Cuppa Tea Collection by Sharyn Sowell creates fun motifs from our favorite drinks that warms the heart and adds a little whimsy. Perk up someone's day with a creation made from this collection. Approximate size: Spoon: 0.70 x 3.20 in. 1.80 x 8.10 cm, Latte: 1.85 x 1.85 in. 4.70 x 4.70 cm, Cup: 2.75 x 2.20 in. 7.00 x 5.60 cm, Inner Saucer: 3.00 x 3.00 in. 7.60 x 7.60 cm, Saucer: 3.25 x 3.25 in. 8.30 x 8.30 cm. Valentine themed Penny Black die featuring columns of elegant hearts. These fun cascading hearts can be used to make a border, or work well as a focal point for your projects. Try it for Valentines day. Craft Dies by Sue Wilson are part of an elegant collection of high quality steel dies designed to coordinate with each other. Includes 2 dies. 2.1" x 6.6". Love themed Penny Black Creative Die featuring a tree with heart shaped leaves. Celebrate your new baby's arrival with the delicate, adorable patterns of About A Little Girl. A whimsical menagerie of cuddly critters. Perfect for layouts, cards, shower invitations, and more! These craft dies include a butterfly, a dragonfly, a heart, and a banner. Create gorgeous bookmarks with this die set. This custom steel die set coordinates with our ST-15-04 This Book Clear Stamp Set and our D-15-04 This Book Elle-ments Die Set. Outer Bookmark measures : 1 13/16" x 5". Inner Three Bookmarks average: 1 1/8" x 1 1/8" Made in the USA. Impression Obsession die featuring an arrangement of hearts. These dies are compatible with most tabletop die cut machines. This is a single die measuring 1.75 x 1.75 inches that cuts a grid of 9 hearts. 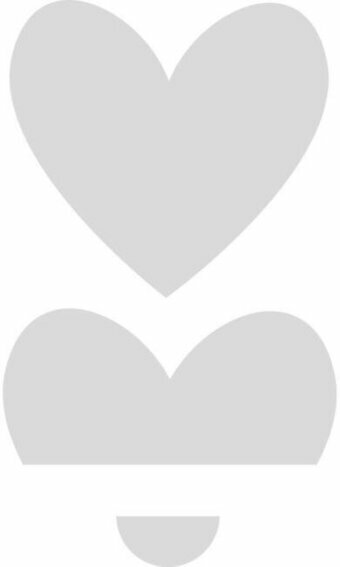 The Abstract Heart Die-namics is a geometric heart shape with an abstract pattern perfect for creating chic Valentine designs. Use this Die-namics as a lacy die cut or inlay different colored card stocks to create a beautiful and unique element on cards or scrapbook pages. This Abstract Heart Die-namics measures 3" x 2 1/4". MFT Die-namics dies are our very own EXCLUSIVE, American made line of steel dies. Die-namics dies work with most tabletop die cutting machines such as the Big Shot & Cuttlebug. The circle die measures approximately 2 1/8" in diameter, the rectangle die measures approximately 2 3/8" x 1/2". Die-namics dies work with most tabletop die cutting machines such as the Big Shot & Cuttlebug. Die-namics dies cut through felt, cork, acetate, & SO much more! 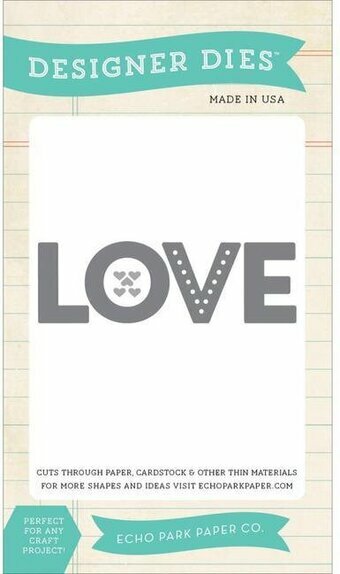 It's a LOVE-fest - this perfect grid of hearts is sized to fit beautifully within an A2 card front. Use the positive, negative, or even create a shaker card! The Full of Heart Die-namics measures 3 3/4" x 5". MFT Die-namics dies are our very own EXCLUSIVE, American made line of steel dies. Can you just imagine all of the lovely balloon bouquets you'll be able to create with this sweet collection? This trio includes three different sizes of balloons as well as three strings to make quick work of building your bobbling bundles. 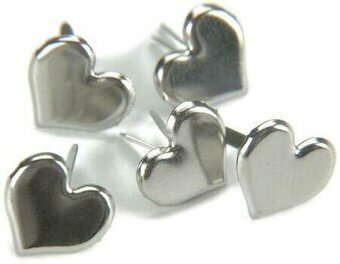 The sentiments included in I Heart Celebrating will provide the perfect finishing touch. This 6 piece set includes: Heart balloons (3) 1 1/16" x 1", 15/16" x 7/8", 13/16" x 3/4", Balloon strings (3) 1 1/2". Build a lovey-dovey bouquet or feature a single floating heart with this sweet little design. This 2 piece set includes: Balloon 1" x 1", String 1/16" x 1 9/16". MFT Die-namics dies are our very own EXCLUSIVE, American made line of steel dies. Quickly and easily die-cut shapes from patterned paper, cardstock and other thin materials! Echo Park Designer dies are a cut above the rest. Compatible with most manual die-cut machines. Craft dies featuring hearts and arrows. These metal dies will add a special touch to any paper craft project. Compatible with most die-cutting machines. Our Floral Lace Heart offers a range of uses. 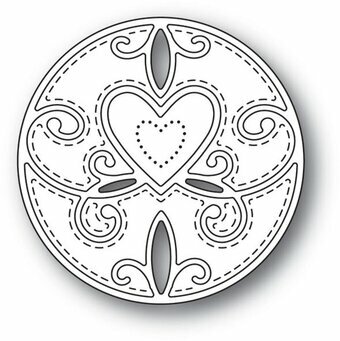 The die cuts an outer heart full of lacy flowers, and also cuts a center heart with a dot pattern. Use them separately or together! The dotted pattern on the inner heart is great for stitching too! Approximate sizes: Large floral heart: 3.75" x 3.5", Center dotted heart: 1.375" x 1.2". This set of 2 corner dies will add just the perfect little flair to a card or envelope corner. 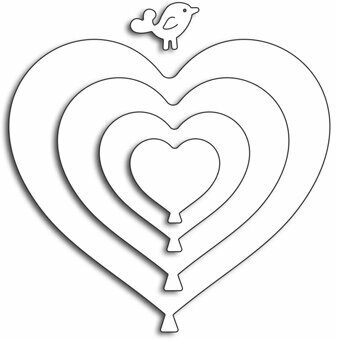 One features a loopy design, and the other features a heart design. They each measure 2.1" x 2.1". 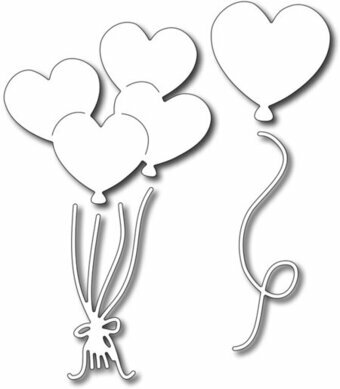 Frantic Stamper Precision Die - Heart Balloons (set of 4 dies). Approx size of large bouquet: 2.6" x 2.5". Valentine themed Penny Black die featuring many different hearts. Valentine themed Memory Box craft die featuring heart flourishes surrounded by a frame made of hearts. Marriage themed Impression Obsession die featuring the Bride and Groom. US-made steel die compatible with most table-top die cutting machines. This is a single die measuring approximately 3-3/4 x 5 inches. I just love love love this design. The dainty heart dangles from a string, creating a subtle border. This die measures 0.8" x 4.2". Impression Obsession die featuring a set of hearts. These dies are compatible with most tabletop die cut machines. This is a set of five separate dies wired together, they can be separated by snipping the wires. The largest heart measures 1.75 x 2 inches and the smallest heart measures .5 x .625 inches. These clear shaker card pouches make it a breeze to add a durable, crystal clear heart shaker to cards, tags, and scrapbook pages. Pouches measure 1/8" in depth. Package includes (10) 2 1/4" x 2" pouches. Love themed Penny Black Creative Die featuring a string of hearts. Valentine themed Penny Black die featuring lots of cute hearts. Bring the knitting circle together with these lovely masks that are Hooked on you! The edge of this mask features a charming hooped design while the mast contains two types of stitches, a woolen heart along with a string of yarn hooping into a heart. There's also a dotted design that's perfect for fitting over your knitting bag stamp for easy colouring. The masks will work perfectly with the stamps, but the fantastic thing about them is they also work great on their own too. All of the masks also have a different border, so you can beautifully frame your projects or create interesting borders and dividers. The masks are perfect to use with distress inks, texture paste, glitter paste, and more. If you?re into inking and colouring, most of the elements on our masks are even big enough to colour through! Size: 5.5" x 5.5". Kaisercraft die featuring hearts. These steel dies will cut through cardstock, thin chipboard, felt, acetate, sticky back canvas, sandpaper, foam and much more! They work with virtually any die-cutting machine that will accommodate wafer-thin dies and are sure to become an essential ingredient in your paper crafting process. These lacy heart shapes are perfect for creating a classic Valentine! These hearts work great to create a traditional Valentine heart with a lacy edge! Lawn Cuts custom craft dies are high-quality steel, made in the USA, and are compatible with most die cutting machines! Approximate sizes: 1 3/8" x 1 1/4", 2 7/8" x 2 5/8", 4 1/4" x 3 7/8". This 5" x 7" Embossing Folder is called Dotty Heart. Compatible with most leading brand die cutting and embossing machines. Personally designed by Leonie Pujol, this beautiful collection is perfect for all your crafting creations. 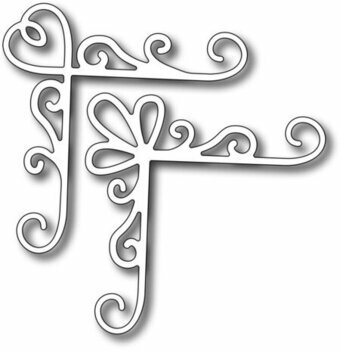 Featuring 5"x7" embossing folders, metal dies and stamp sets. With this papercrafting collection so you'll have everything you need to create a beautiful cards. Lovely Bubbles (5 metal dies) - Largest Metal Die Size 5.2" x 5.5". Compatible with most leading brand die cutting and embossing machines. Personally designed by Leonie Pujol, this beautiful collection is perfect for all your crafting creations. Winter themed Memory Box craft die featuring a snowman and hearts. 2.5 x 2.7 inches. Memory Box craft die featuring the sentiment "Home is Where the Heart Is". 3.2 x 3 inches. Memory Box craft die featuring a Lace Cut Heart. 2 x 2 inches. Memory Box craft dies featuring a village. 0.8 x 1.4, 0.8 x 0.9 inch houses assembled. Memory Box craft die featuring hearts. 5 dies included. Garden and gardening themed craft dies from Hunkydory Crafts. A Work of the Heart includes a shed and a bench, both surrounded by grass and pretty plant pots, as well as a decorative fountain, a cheeky gnome and more. 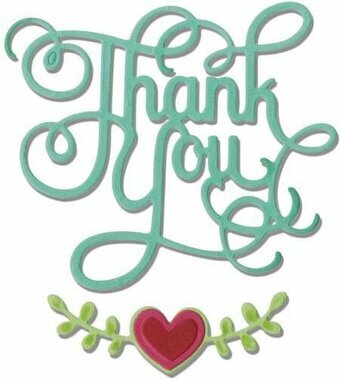 Nellie's Choice - Hobby Solutions Die Cut "Floral-1 Border". This floral border die will make an attractive addition to any project. Size: 4.5" x 1". Nellie's Choice - Vintasia Dies "Two Hearts". This set of two beautiful hearts are perfect for Valentines or Wedding projects, but are so versatile you can use them in a variety of settings to add a pretty touch to your cards and layouts. Size: 2" x 1.75". 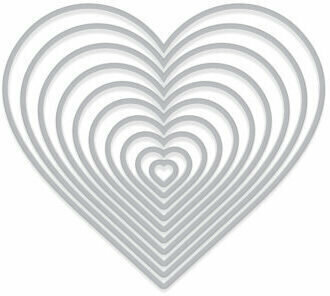 These nesting heart dies are of solid metal construction with a sharp and durable cutting edge. Ideally designed to work with most papers and other thin materials. Set contains 10 metal dies measuring from the largest at 4.66" x 4.11" to the smallest at 0.27" x 0.23", with a separation of 0.125" between the dies. Stand Alone die - This border die will make an amazing accent to your projects! Each heart is connected on one single die. The hearts are hand-drawn and one of a kind. Approximate size: 1" x 3 1/2". Stand Alone die - This is a (one of a kind) die collection of three unique hearts and one arrow. This set is wonderful for wedding, anniversary, Valentine's Day, etc. Approx. sizes: A. 1/4" x 3/8", B. 1/2" x 1/2", C. 3/8" x 3/8", D. 1/4" x 7/8".